Citation Information: J Clin Invest. 2016;126(11):4187-4204. https://doi.org/10.1172/JCI78260. 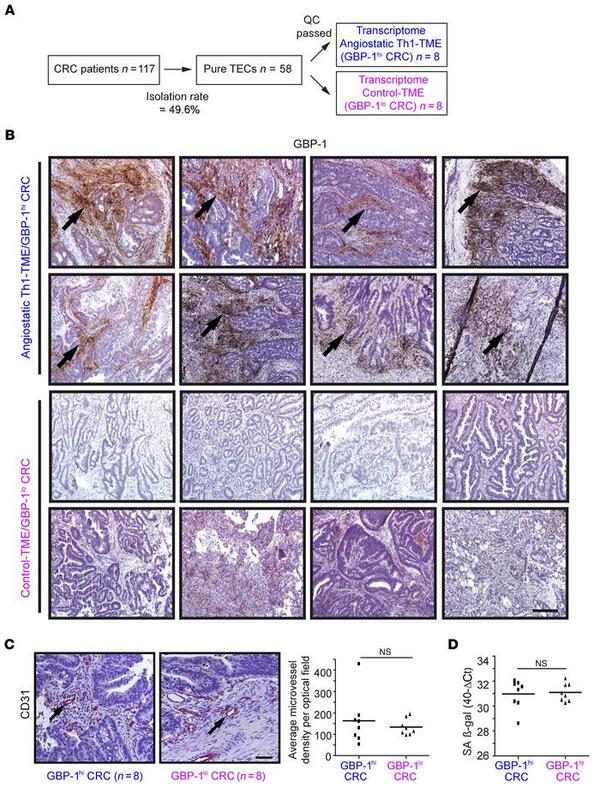 Study groups were established according to isolated TECs from CRC tissues that had an angiostatic Th1-TME or a non-Th1 control-TME as well as comparable microvessel densities and senescence. (A) In total, 58 pure TEC cultures were isolated from 117 patients using a CD31-based MACS protocol. The isolation success was 49.6%. After application of stringent quality criteria (QC) (see main text), 16 TEC cultures derived from CRC tissues with an angiostatic Th1-TME (n = 8, blue) and control-TME (n = 8, pink) were subjected to transcriptome analyses. (B) For the study, all tumors with angiostatic Th1-TME (GBP-1hi) and those with a non-Th1 control-TME (GBP-1lo) and less favorable prognosis were differentiated by GBP-1 expression (brown, arrows) using IHC. Scale bar: 250 μm. (C) Microvessel density was detected by CD31 staining (left panel) in tumors from B. For each tumor, the average number of microvessels per optical field was calculated and is shown (right panel). Scale bar: 50 μm. (D) RT-qPCR of SA β-gal expression in the tumors from B. The expression levels are given as 40-Ct values. (C and D) Statistical significance was determined by Student’s t test. Mean values are indicated by line; NS, not significant.